GCL Mafia 146: What the hell is Quinoa? The first few items are intended to foster discussion. This week's theme is all about... Food! Yummy, delicious, damn fine food! Please add an item to represent your gaming life for the week of Oct 28 - Nov 3, 2013. List any games played along with any other information that you deem appropriate. Also, feel free to give life updates, fun facts, or any other super exciting and utterly interesting thoughts you may have. Amanda & I have quite the symbiotic relationship: I love to cook and she loves to eat said cooking. Hell, who am I kidding...I love to eat my cooking as well. You could call us foodies, really. So with that in mind, this week's topic is all about that which sustains us, but with more salt! From where in the world does what you most enjoy eating, originate? And what is that dish? Do you like to cook? If so, what's your favorite dish to make? If not, who is the cook in your house? What food from your childhood were you loathe to eat, but now enjoy (love?)? Have you ever worked in the restaurant industry? If so, what jobs have you worked? Any good (or horrible) stories to tell? What is the best restaurant that you've ever eaten at? What's the very single best meal you've ever eaten, period, the end, itgetsnobetterthanthatorifitdoesGodblessya? Guilty pleasure when it comes to food? Do you have a 'destination' restaurant and if so, what & where is it? 1) I was laid up at home thanks to not feeling well. 2) I had to finish editing and uploading the first video of my Across the Table video series. So that kinda limited how much we could play this week. What we lacked in quantity, I think we made up with in quality. 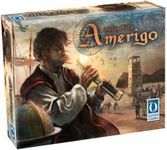 I got to play Amerigo for the first time (Amanda had played it once already and loved it) and man, it's definitely a Top 3 Feld, ibooo's (in both of our opinions). Definitely one of this two most complex as well (along w/ Bora Bora). Highly recommended if you enjoy Feld's games. King of Siam - Thinky, chess-like, quick game that plays well with 2 or 3 players. I would say go get a copy if that's your thing, but, well, it's OOP...for now. Ground Floor - Still, ibooo, one of the very best games to come out of Kickstarter. I'll be doing a video for Across the Table in the next month or two on this. It's a fairly heavy worker placement, economic, business-building game. Seriously, I'm not sure if it is because it has the "Kickstarter game" stigma attached to it or what, but man, it is a wonderful, under-the-radar game. Pax Porfiriana - Both of us love this game. So much game in such a little box. Phil Eklund's most approachable game. It's a wargame, meets Euro that's just dripping with theme and history. Usually takes folks 2-3 games until it 'clicks', but I have yet to teach this to anyone and not have them love it. Compounded - A friend of ours backed this on KS and we've since played it twice. Fun, enjoyable set collection game. Glory to Rome - Great card game that scales well. Wow, 4 kickstarter games this week? Hmph, didn't realize that. Well, that tells me that we not only spend too much money on KS, but that there are quite a few great games that have been born from there! No new games this week, but I did get to try The Fantastic Four Expansion for Legendary. It had some pretty cool new cards. I really need to play the game more and explore the many different cards I have in there now. Despite no new games, I had an excellent gaming week with some really good/notable plays. I haven't played Agricola in person for a long time, so that was great to get out (and teach to two new players and burgeoning gamers). Myrmes was my second play in person and gave me a much better understanding of the game for my online plays as well as helped me appreciate the game more overall. Finally, Prêt-à-Porter was my first time playing with four players and it went very well. I'm still enjoying that game quite a lot. A lot of TtA, as you can see. And all on BGO. I should get an additional 8 plays in the next month since I've just signed up for league play, 4-player. I want to sign up for 3-player and 2-player as well to diversify my experiences and develop against other players. I've got a long list of wins (finally broken recently by McJarvis, grr...) since I've been playing a lot against friends we recently taught who are still getting used to the game. I've started getting scared in mid and the early part of the late game against my one friend because he's been doing better, but then I still manage to win by a good margin by the end-game. Also, in our most recently completed game, I was able to devestate him. I got him to sacrifice his entire army to an unnecessary war on technology, which I followed up with a war that wiped his entire population. I had two more culture wars to follow up with after that, but he resigned, seeing the inevitable. Taluva was a fun play this week, and was probably the highlight of the week. It's one that's very simple and clear, but I haven't grasped any strategy, yet, in the game. I feel bad for a game that seems so simple to feel so far behind in developing strategy. I'll have to play it some more. This was my second time playing Cosmic Encounter. This was a more enjoyable experience than the last time I played. I won again this time, only this time it was by myself. It was a close game between several players, and due to a racial ability, when the next player would've started their turn and been forced to draw a new hand, somebody else would've won. But I got into an epic battle that was having several cards played back and forth to swing the battle's favor in either direction, until finally I played a card that basically said "if both battle cards are the same value, I win." Finally, we played Speculation. I enjoy stock games, but not the type of stock games where I lack control. It's frustrating having very VERY limited control over which stocks I affect (a choice between two cards), and only being allowed to exchange stocks 50% of the time, and not being able to predict when those times will be (we played with the dice instead of the tiles). Still, it was okay, but I'm definitely not craving playing again. Auf Teufel komm raus is a little bidding/bluffing game of flipping over coal tiles and hoping not to bust. It's got an interesting aspect whereby if any one player manages to flip a total that covers your bid, you're in the clear (but with bonuses to them who bid/flipped the highest amount). Not bad, most likely decent super filler. Speculation was...OK. We played with the chits and bags and it seemed there was enough trading going on that there was some semblance of control. That said, the randomness of the advancement of stock prices made the game outstay it's welcome by more than a little (though playing with a nearly full compliment of six probably didn't help either). My feeling was that if it was going to be a light, swingy game of stock manipulation (I won through extremely short-term buy-low/sell-high actions) it should at least be an hour max. I like what it offers in principle, but think that it stumbles a bit in the execution. The dark horse game of the Essen batch would have to be ebbes, a chimeric trick-taking game that's on par with Sticheln in devious trickery. It's "thing" is that each of the five suits gets designated as a different type of scoring card as each hand progresses, with each hand having a specific numeral triggering that suit. The first suit triggered becomes trump, the second are positive points, the third is the "ebbes" which scores if you *don't* have the most or least, the fourth negative points and the fifth nothing. Each hand a card is flipped from a small deck which determines which numeral value will be the trigger that round, and the whole of that deck is gone through before being re-shuffled and re-used. It's twisty and subtle and evil and mercurial and really, really awesome. I can't wait to play it again. Machi Koro is a fine little piece of super-filler. It's got a dice rolling mechanism for getting money which you can use to buy building cards which get you more money etc. There's some interesting tactical balance where some buildings get you money only on your turn, while some get you money on other players turns (based on the die roll, natch). It's light and fluid and well designed and I can see why it's getting the buzz that it has. I'm a little worried about the unevenness of the pacing due to the die rolling, but it looks like it could even out with better play. It didn't set me on fire, but it's not bad either. Ka-Boom is an absolutely hilarious dexterity game with catapults and table slamming. A total hoot and well worth a look. I received my indiegogo'ed copy of Town Center a few weeks back and finally got it to the table after having played 5-10 solo rounds. The designer has stated in the forums that the solo game isn't really the game proper and more of a learning tool, and he was absolutely correct in that the multi-player experience really opens up all the various scoring options. That said it's just as brain-burney and requiring of a couple of plays before everything falls into place. I like it for its uniqueness and definitely need to give it a few more play-throughs before I pass final judgement, but for the moment I like it. Polterfass is a light bidding bluffing game similar to Auf Teufel Komm Raus, though I much prefer the former for a few reasons: it's got little barrels as dice and the way they land indicates whether you can re-roll them again or not, it's incredibly speedy, and it holds up much better with 6. I'm very glad that someone in my group has a copy and I won't say no to future plays. Concept is a party game where players use a huge board of illustrated icons (mostly in pairs of opposite ideas, like "Hot/Cold," "Real/Fictional" etc) to illustrate sometimes very complex concepts. You have five sets of markers and correspondingly colored cubes used to mark the main and ancillary concepts of whatever it is you're trying to get the group to guess. We only played with the easy answers, but it was easy to see ratcheting up the difficulty as a group got better at the game. Not something I'll ask for, but interesting (if not really all that fun). BANG! The Dice Game is probably my favorite iteration of Bang!. Short, streamlined and vicious, it sidesteps the problem of endless games and delivers a concentrated 10 minute "who's who?" experience that is really what the base game should have been all along. It may even be too boiled down, but given how much of a slog some games of Bang! could be, I welcome any form of short playing time. Those who have written off the base game as being bloated and ungainly should definitely give this version a try. After an awesome week of play, nothing really exiting this week. - Blood Bowl: Team Manager – The Card Game with children ? - Metropolys/Puerto Rico with wife ? - Lewis & Clark : not in the end. - Prosperity : not in the end. Too dry and weird. I finally got to play Spyrium last week. I was both surprised at how light the game is and at how enjoyable it was at the same time. I'd like to try it again before making a final judgement, though--- I won the game while collecting buildings which allowed me to place meeples on them for points. The last turn of the game I placed zero meeples out into the world, instead opting to just generate points at home. That seemed a little lame, since it cut out all the interactivity out of the game. Another great gaming week. I played a game of 1830 where I had the win and threw it away by starting two undercapitalized companies (my second and third) and then not putting one of the two of them into the yellow. Still, I probably would have won except for player sticking with 4 trains. If I had dropped my third company into the yellow, I could have forced the diesels and likely won. :shrug: this game continues to be a learning experience for me and I continue to love it. I've now played Spyrium four times (the last was lunch yesterday) and I really like it. My last play was a 2-player game that finished in under 40 minutes which makes the game much more attractive to me. I still need to get in a game with Amanda (hopefully tonight). I borrowed it from a game library and will need to return it this weekend so I tried to get in as many plays as possible. That said, I think it's got long term replayability and am seriously considering getting it. What makes it interesting to me is the push your luck worker placement and the dutch auction. 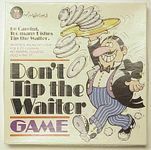 It's not clear that more workers are better or moving up on the residence track (with the exception of the 2-player game). Everything in the game depends on your strategy. 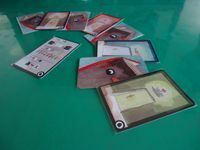 While discovering the strategies isn't particularly difficult, since it is at its heart an auction game, played with players of equal skill, better cards will cost players more and thus balance out strategies. This will likely be in my top 5 games released in 2013. Factory Fun is fun. It's brain-burny and irritating, but fun. We played tow 2-player games and I think Amanda was willing to play a third. Although I've heard it's better with more, after playing this solitaire, I found any choices for machines made the game much easier. I can't wait to see how a 4 player game goes. With 4 machines to choose from, I might actually start scoring over 40. Die Fugger is an Adlung-Spiele game, meaning it's a small box. However, it plays like a big box card game. Players speculate on commodities while playing cards to influence their prices. The twist is that the prices are in a circle, so if the price of a commodity goes above 9, it drops back down to 1. Played great with 2 and I'm looking forward to playing it with more. This has made me want to try out more Adlung-Spiele games. I'm not yet sure how to rate Sun, Sea, & Sand. It was a very enjoyable game. It has a bit of a worker placement feel. There's a little bit of blocking to get tourists and attractions and there's a lot of multi-player solitaire (the two things I find most common in most worker placement games). However, the game is pleasant and has both an economic and temporal aspect. At this point, I can't decide if it's a 7 or an 8, but in either case, I expect I'll hold onto it for a while. It doesn't take the place of Walnut Grove, but it has that similar Gateway+ game that's fun to play when I don't want a brain burny game. Mauna Kea was an amusing experience. First off, I got the wrong set of tiles (I was short 4 starting tiles and got 4 extra regular tiles which probably means that they put a wrong tile sheet in my box), sent an email to Huchi and haven't heard back yet, which is majorly irritating. I'll probably send a follow up today. When I played my first game at a game night of gamers, I decided to start with the advanced rules. We're gamers, right? We don't need to start with the basic game? By the end of the second round, one player had all of his explorers burn up in the volcano and the game ended. The winner was the player who used his helicopter card to escape with one artifact and won with 1 point. The rest of us all had zero. I figured before I tossed it in the trash, I'd give it a try with Amanda in the hopes of playing it with the kids. We played the basic game and it flowed (pardon the pun) much better. In the basic game, tiles are replaced so the lava extends much slower. As a result, all but one of each of our meeples made it off the island. 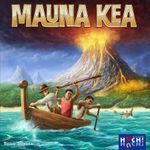 While, Mauna Kea is lighter than I expected, I think it'll be a good game. What's more, now that I understand the tempo of the advanced game, I'll keep different cards and be prepared for the lava flowing quickly. I played El Grande again for the first time in about 4 years. I don't know that I can explain why, but it just fell really flat for me. The company was pleasant enough, but I just found myself irritated by the game. The mechanics are good, bidding influences turn order and inversely the number of additional cubes you get. However, it felt like generally the cards that let you put more cubes on the board were also the more powerful cards, so going first was better and the biggest decision was when to drop back to get cubes and get to bid first the next scoring round. It felt too random, both in the cards that popped and the bidding for turn order. As more and more reports come back, I find myself more and more disappointed with this year's crop. I didn't have much hope prior to Essen, but now that it's over, I still feel disappointed. That's not to say there weren't good games there. Caverna: The Cave Farmerssounds like an improvement over Agricola. Glass Road sounds like a quicker 'Gric with a role selection mechanic. Russian Railroads sounds like a good innocuous worker placement game (my opinion on RR changes multiple times per day). Bremerhaven sounds like an interesting blind bidding resource engine building game. Nations has the potential to be a TtA-light game. Packet Row looks like an interesting card game. Rococo sounds like a deck building worker placement point salad game. I still don't have any feel on Legacy: The Testament of Duke de Crecy. But with the possible exceptions of Patchistory (somewhat innovative civ game that needs a new rulebook and English release), nothing sounds particularly innovative. I've ordered Concordia and am excited to play it, but I still expect it to be a rehash of existing mechanics put together in a polished and interesting way. I kickstarted A Study in Emerald and have some hopes that this will be innovative but I suspect it will also end up being, at best, existing mechanics put together in a new Wallacian way. In this mix, Spyrium seems to be high on the list of innovative 2013 games with its push-your-luck worker placement, dutch auction mechanic. Oh, I do have some hope for Impulse. Chudyk is always innovative (badabum) and Impulse looks promising. Along those lines, Hegemonic may also be innovative for a 4X, but I'll be waiting to hear reviews before checking it out. I'm not saying it was a bad year. 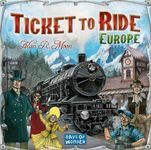 For those new to the hobby, games like Caverna, Russian Railroads, Concordia and Rokoko will likely be excellent games to pick up. However, for me, I think this will be a year where exploring the classics will better suit my tastes. edit: I forgot to mention 18OE and 1862 above. I've enjoyed my plays of 18OE and find its all companies chosen before you start mechanic innovative and I'm excited about 1862 and its different types of trains. I finished Flow My Tears, the Policeman Said by PKD. I really liked it overall, but it has easily the worst epilogue I have ever read. It is entirely unneeded and undoes many of the events that occur near the end of the book, completely ruining the impact. Other than that, it deals with how observation changes reality and is further complicated through the intake of various narcotics. PKD's prose is definitely much stronger here than his earlier works as he uses atmosphere, dialogue, and characterizations to paint scenes. After this, I read For the Emperor by Sandy Mitchell, the first of the Ciaphas Cain 40k novels. This is probably the most standalone work I have read of the 40k books. It was enjoyable and Cain makes for a better main character than is usually featured. He has a lot more personality and fits in with many other super-British characters that are heroic despite their best efforts to the contrary. It's not the best 40k novel I have read, but it requires no knowledge of the rest of the universe. Good, pulpy fun. I am now wrapping up The Simulacra by PKD. This may be the largest collection of concepts that he has dealt with in a single book so far. It features Nazis, time travel, Judge Dredd style totalitarianism and blocks, simulacra (androids), devolving humans, telekinetic pianists, mind controlling synthetic aliens, and teleporting space ship dealerships. All of this in 230 pages! Enjoyable, but I cannot really provide a full opinion till I have finished it. Next will be Caves of Ice, the second Ciaphas Cain novel. Yes, Bananagrams is the only thing I played this week. My wife and I sat down on Monday to unwind by spelling out all of our frustrations... or something. I actually enjoy Banangrams on occasion; it's an enjoyable light 2 spelling game which is as competitive as you want it to be. Marian and I are surprisingly uncompetitive. I think this week I'll try to upgrade to Scrabble or pictionary.